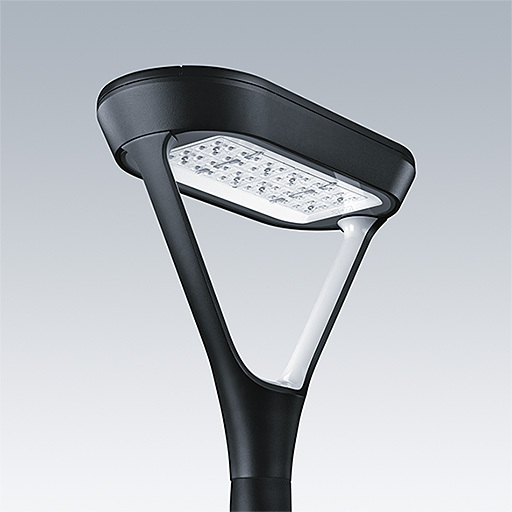 A smart, sophisticated architectural urban lantern with 48 LEDs driven at 500mA and a Extra Wide Street & Comfort optic. Electronic, fixed output control gear. Class II electrical, IP66, IK10. Canopy and base: die-cast aluminium (AS9U3, LM24 equivalent, EN AC-46000) textured black (close to RAL9005). Enclosure: 6mm thick clear glass. Arms: die-cast aluminium textured black (close to RAL9005) covered with a shield in plastic ASA. Pre-wired with 6m cable. Post top mounting to Ø60mm column, luminaire perpendicular to the road. Equipped with power reduction circuit, effective 3 hours before and 5 hours after a calculated midnight. It can be deactivated at installation with an easily accessible internal switch. DALI controllable with additional signal cables. Complete with 4000K LED.